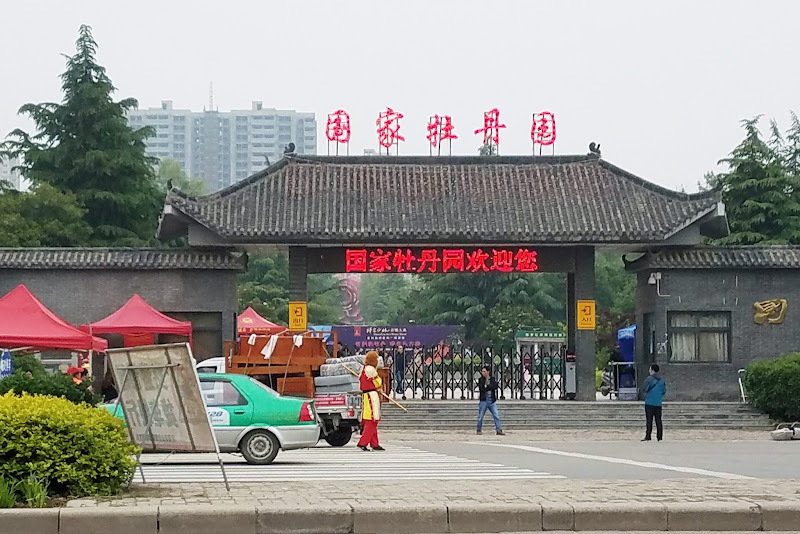 This photo of the Luoyang National Peony Garden gate is actually the entrance to the North side of the garden. However I didn't have the opportunity to photograph it until we were just about to leave (after we finished touring the South side). When we first arrived, there were so many people and cars out front, plus a couple of monkeys waiting for tourists to hop out of their cabs! The monkeys were actually people dressed up that wanted to take pictures with you for money. You can see one of them in the photo in the red and yellow costume. 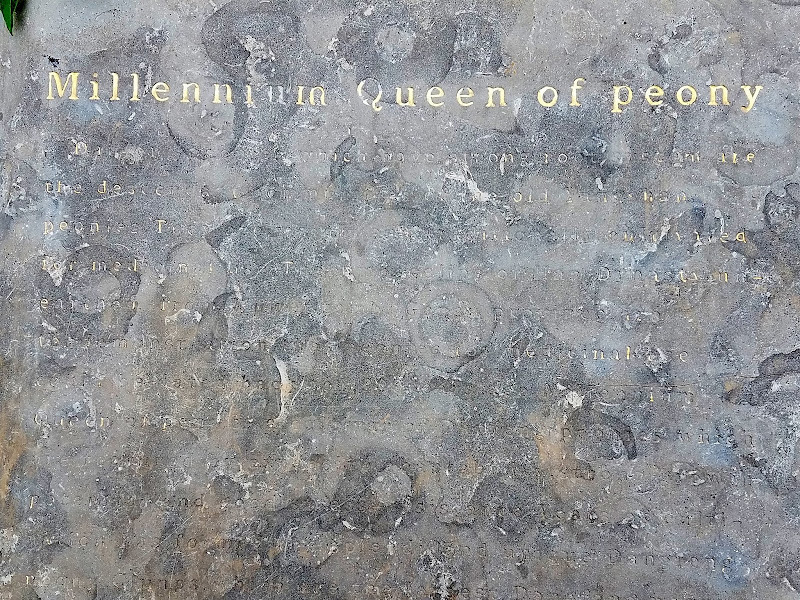 (Click the photo to see a larger version.) 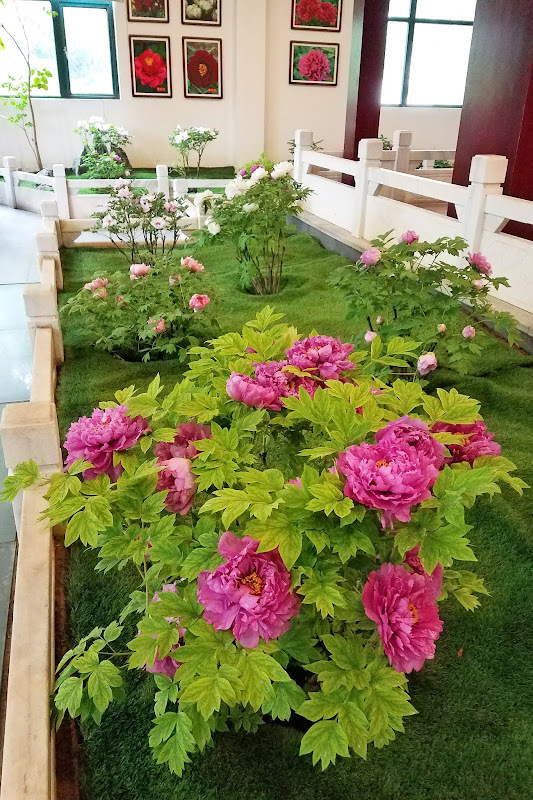 If you missed our first article about the North side of the garden, you can read that here, 2018 Southern Peony Visits Luoyang National Peony Garden 洛阳国家牡丹园 (North). 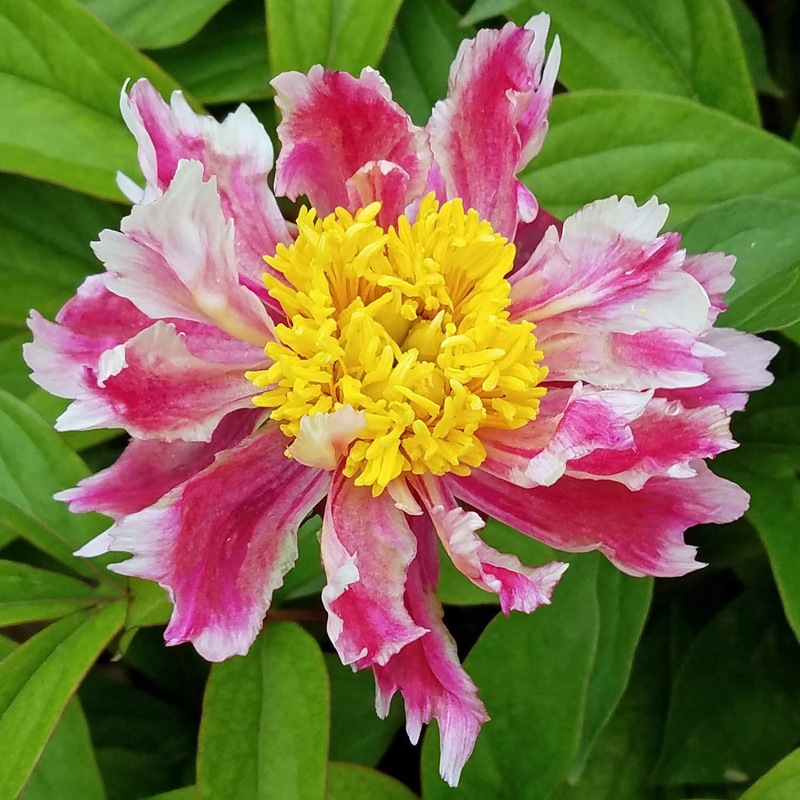 Below are a few photos of herbaceous peonies I happened upon that were not in a mass planting. 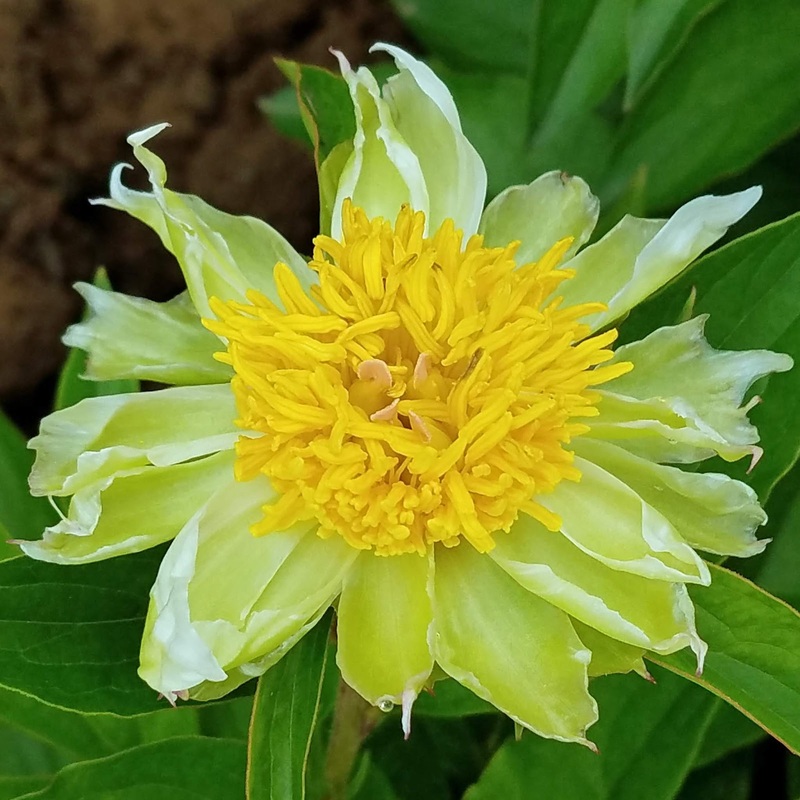 They seemed to be growing in a bed of peonies that were all different (an unusual find in these large Chinese peony gardens). 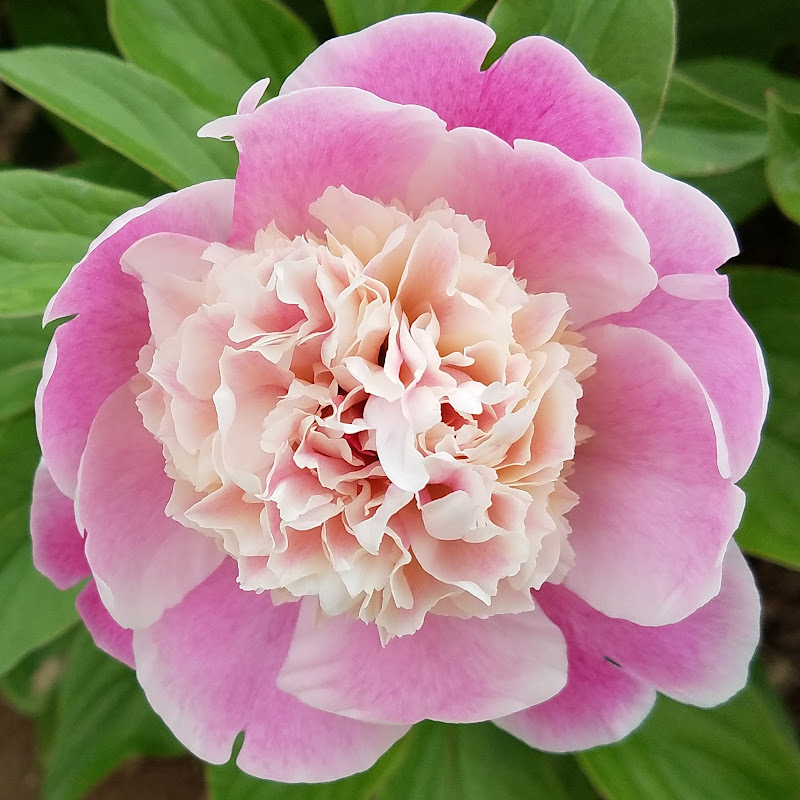 "Peony’s being considered as “the national beauty and heavenly fragrance”; is originated from a poem which reads “enchanted by the national beauty, we enjoy wine in the morning light unconsciously, till our clothes are permeated by the heavenly fragrance at night”. 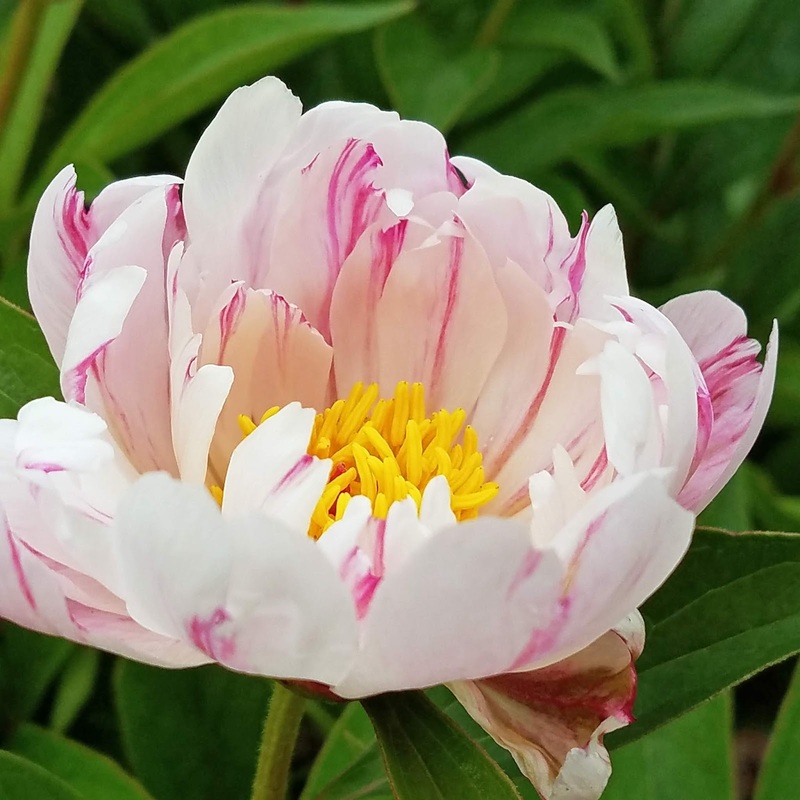 Peonies have bloom in the imperial garden to add ornament and splendor since Sui Dynasty. 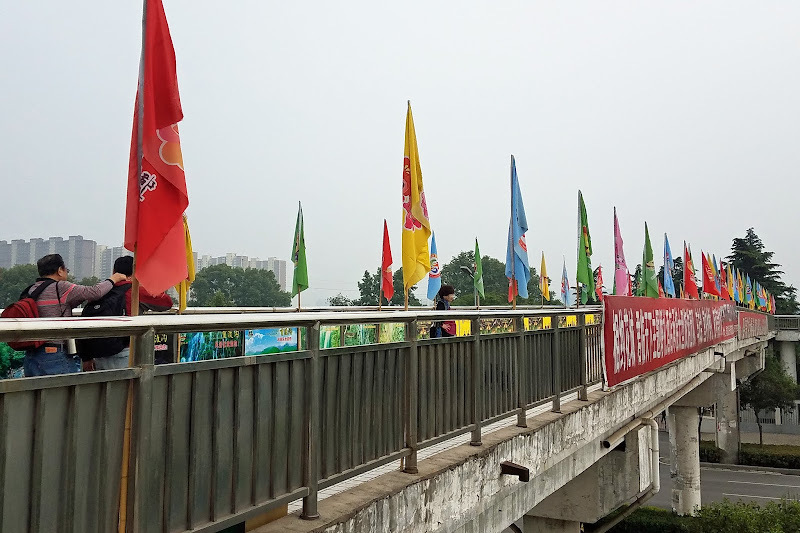 In Tang Dynasty, made the national flower for its symbolizing the good fortune and prosperity. Luoyang as the city of origin for primitive peonies has an over 1,600 years’ history of cultivating peonies. 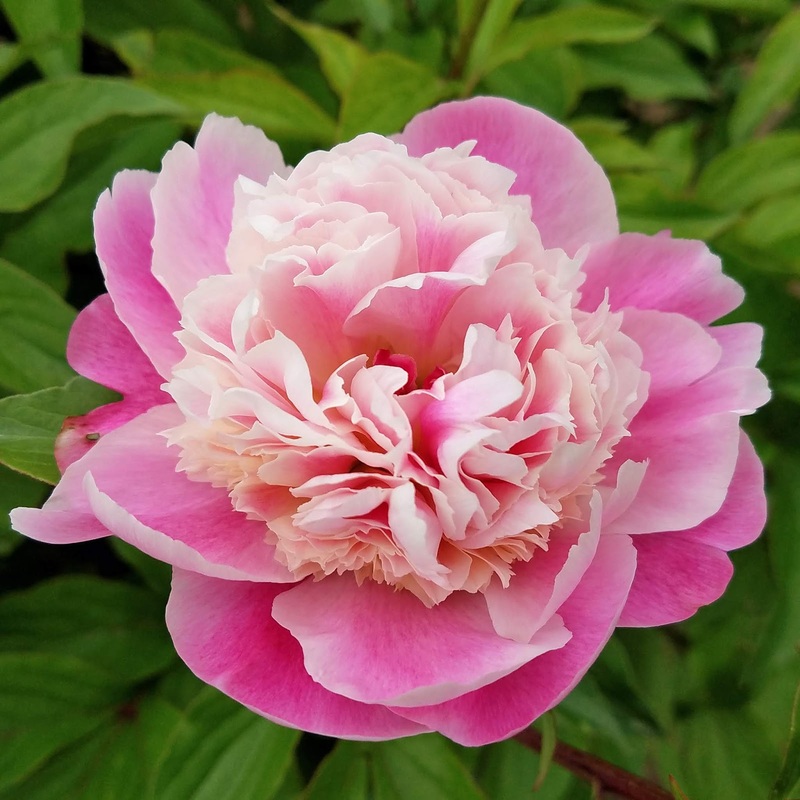 In Tang Dynasty, peony was also called Luoyang Flower. 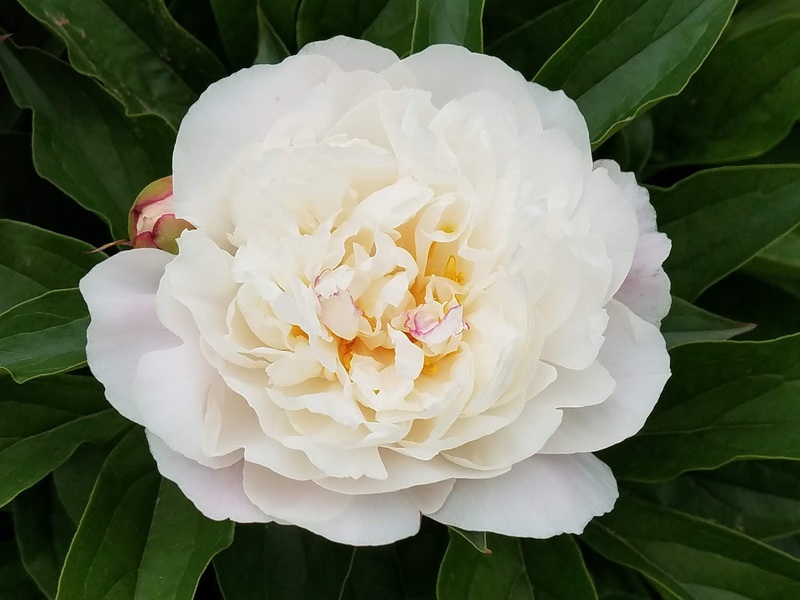 There were many precious and rare cultivars in the history of cultivating peonies and the number of cultivars has once topped more than 2,000 in its golden age. However, due to the absence of special systems or institutions for germplasm conservation in the past, most of the cultivars were lost or extinct. 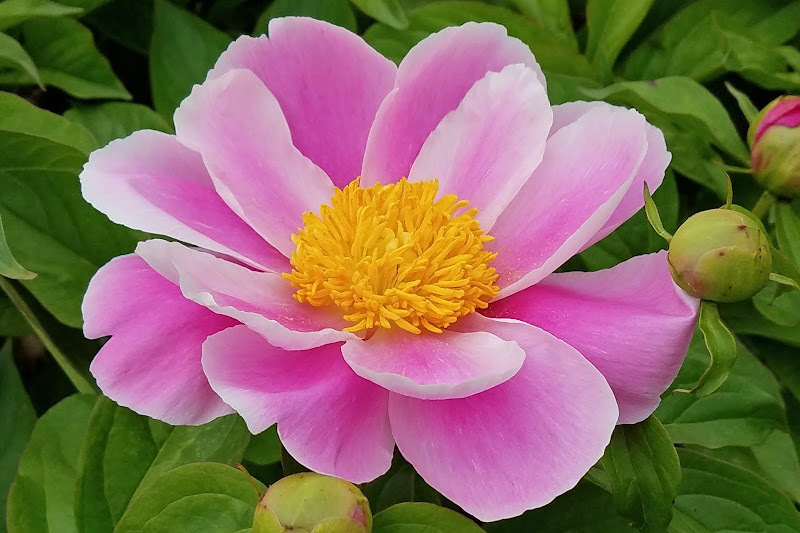 To save and preserve endangered cultivars, the National Peony Gene Bank, which is responsible for the collection, cultivation and development of peony cultivars, was approved to establish by State Forestry Administration in 1992. 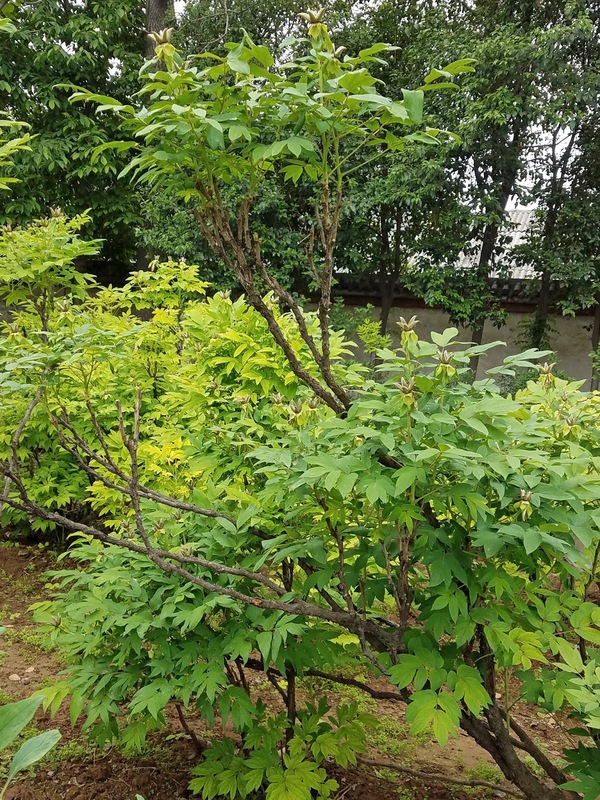 At present the Bank has collected 1352 species, among which are 9 domestic primitive species, 2 wild subspecies, 1140 domestic cultivars, 120 rare species introduced from the overseas, 92 ne cultivars. 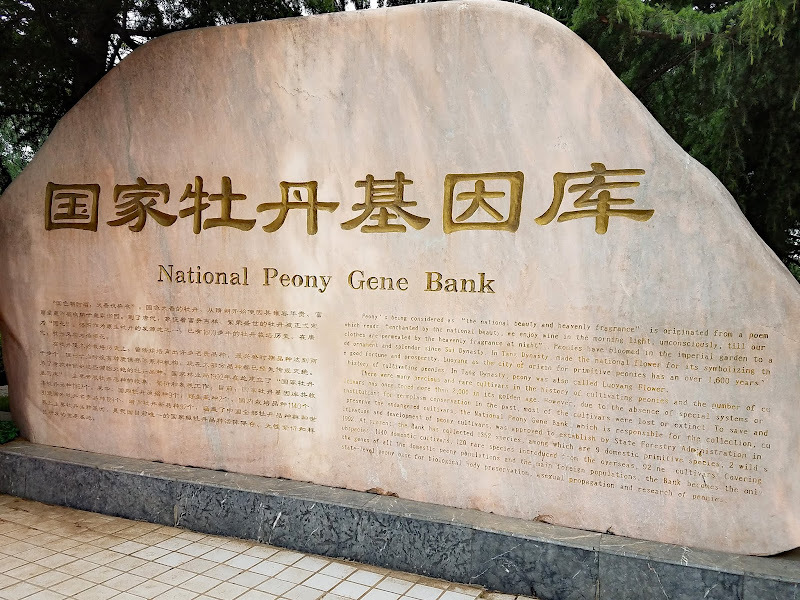 Covering the genes of all the domestic peony populations and the main foreign populations, the Bank becomes the only state level peony base for biological body preservation, asexual propagation and research of peonies." 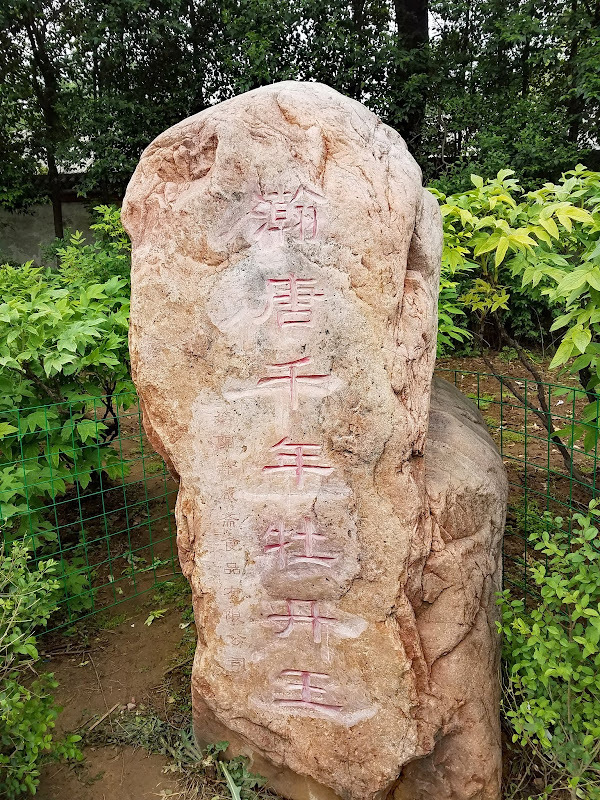 Once we explored the South side of the garden more, we found there were several commemorative stones and statues on this side. Perhaps the South side was the original garden, and the North side was the expansion. 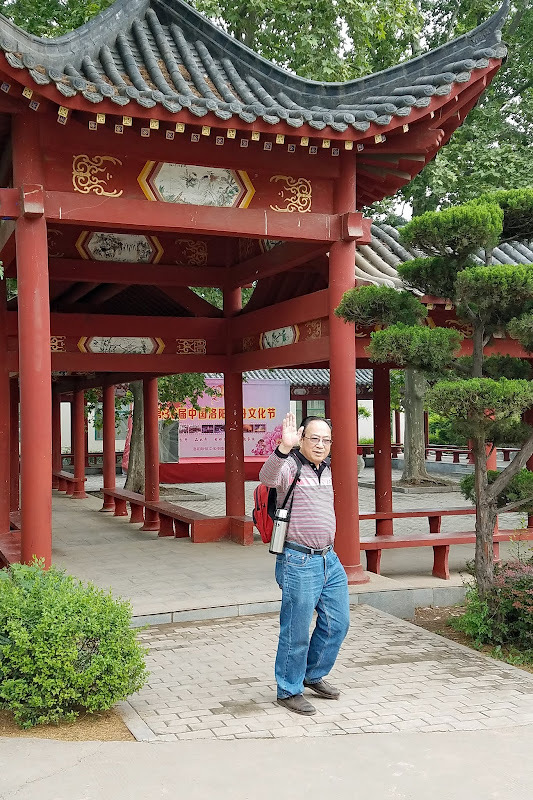 My father in law, Dake, is standing beneath the Chinese Pavilion Pagoda. 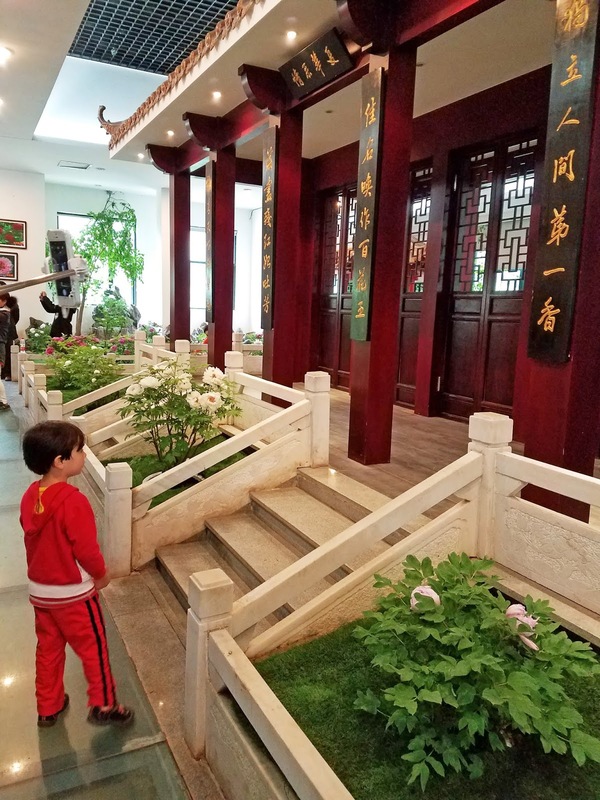 This pagoda and pavilion are in the traditional Chinese style, and they led us to the entrance of the indoor peony garden on the South side. 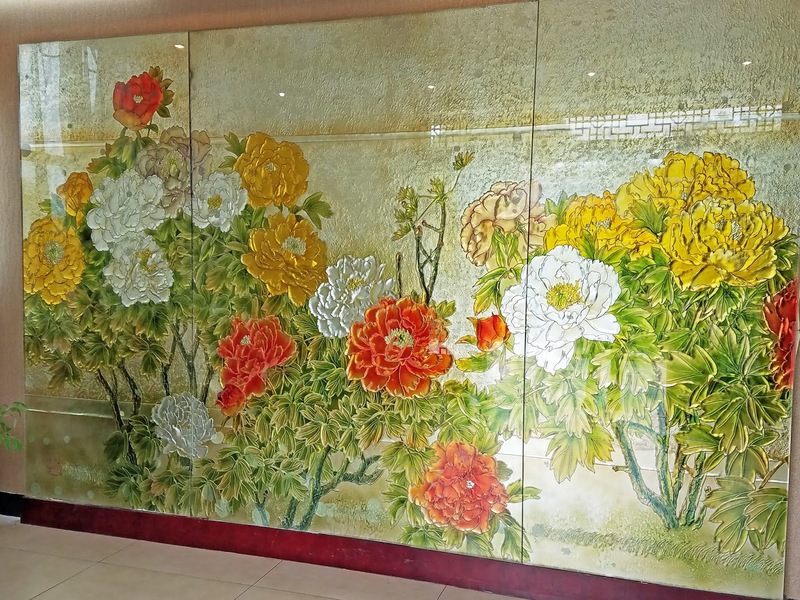 Just inside the door were these very beautiful and very fancy peony art glass panels depicting some yellow, orange/red, and white tree peonies. The panels were taller than us, quite a work of art! 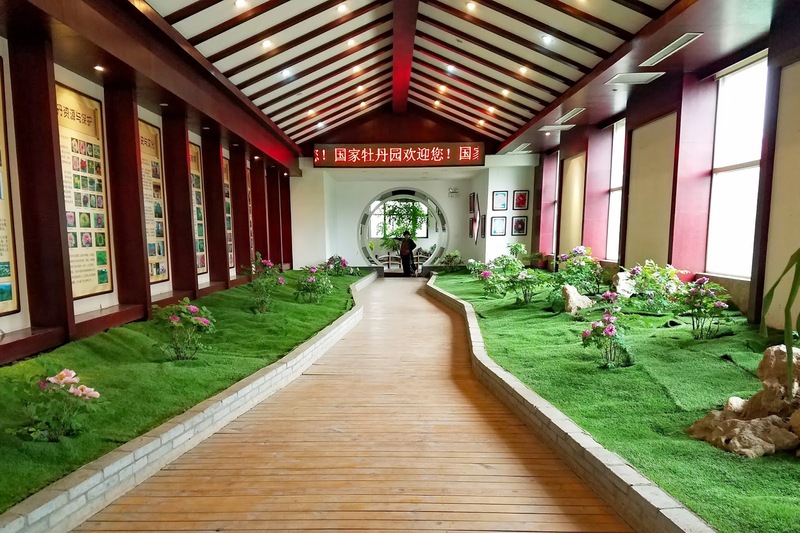 Once we passed the art panels, we came to an entrance hall with a crooked path of hardwood flooring edged by a low cement brick wall and flanked on each side by faux grass gardens lined with potted tree peonies. Most of the tree peonies seemed to be popular varieties we had seen before. 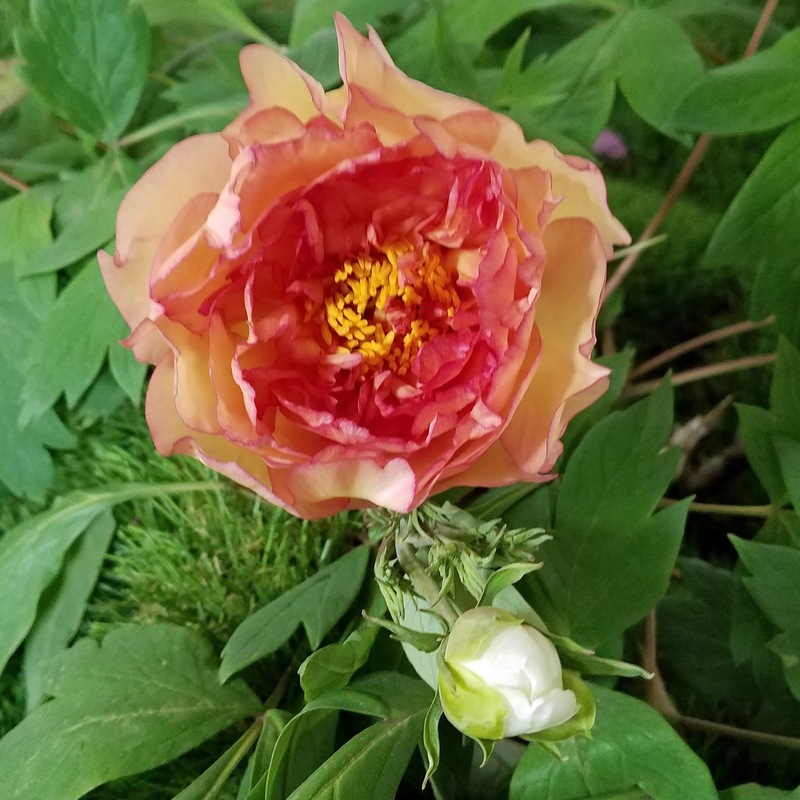 However one tree peony in particular caught my eye because of its unusual coloring - a bright orange! When I came to see it for a closer look, I was surprised to see that there was another bud right beside it in a different color - white! I could hardly believe my eyes. 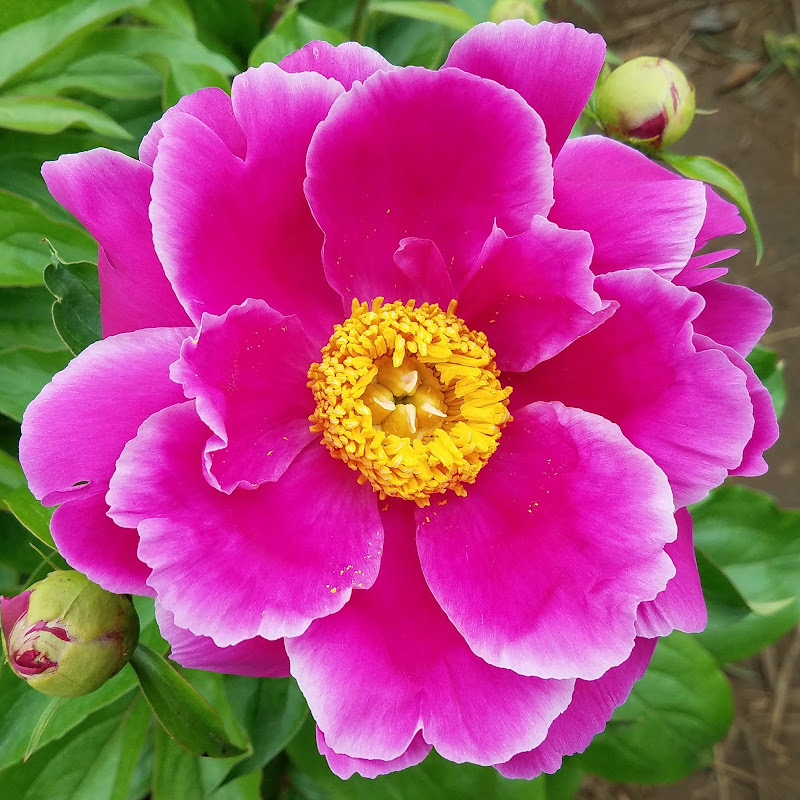 There appeared to be two different colored peony blossoms growing from the exact same stem! Amazing!! Inside the main room of the indoor Chinese tree peony garden, there were several pagodas and a central hall, all with golden yellow roofs. Stone seemed to be the theme in this room. 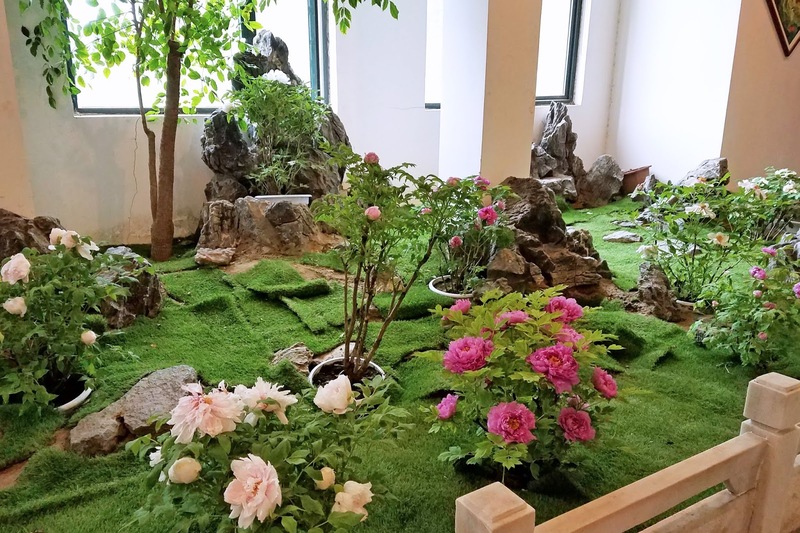 There was stone tiled flooring, white marble fencing with intricate peony carvings on each panel, and jagged, dark gray garden stones scattered around the perimeter of the room behind the faux grass tree peony gardens. There was also an indoor water feature, with smoother, pointy large stones in the water and around the edges. A natrual wooden Chinese style bridge crossed over the water feature, as did one of the pagodas. The potted tree peonies in this room were all nice, large specimens loaded with blooms in pinks, whites, and lavenders. 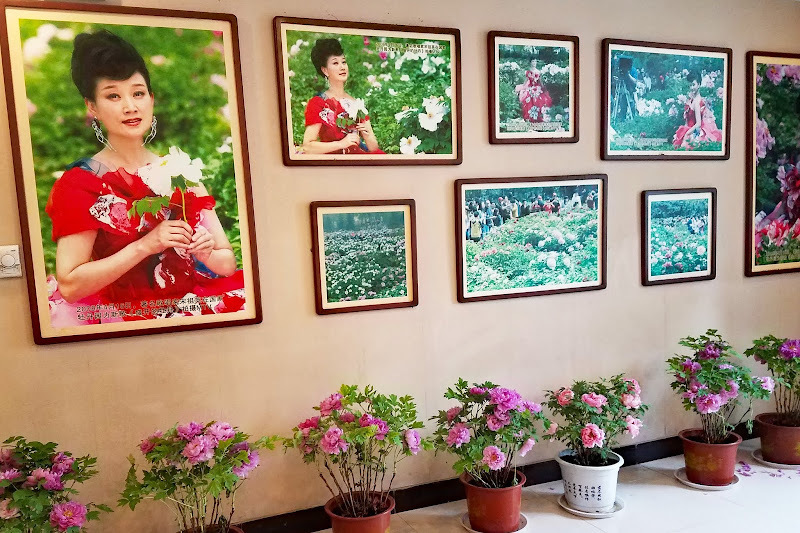 The last room of the building contained some portraits of Chinese women posing with peonies, perhaps peony festival queens from years past. There were also several potted tree peonies blooming along this wall. The last room also contained a few historical peony items encased in glass - ceramic peony plates, peony wine, peony soaps, and peony teas. The Chinese people really seem to love their peonies. They make everything out of it. 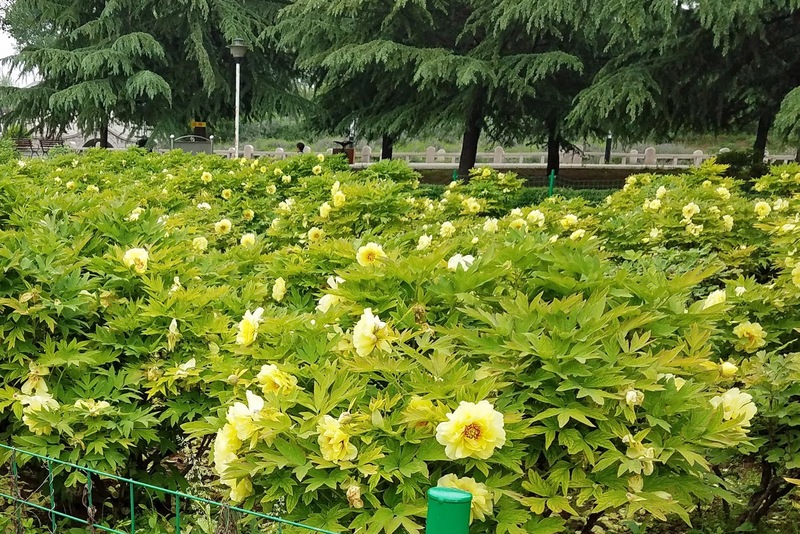 While exploring the South side of the garden, we also came upon a mass planting of yellow tree peonies in full bloom, set against a backdrop of lovely fir trees. 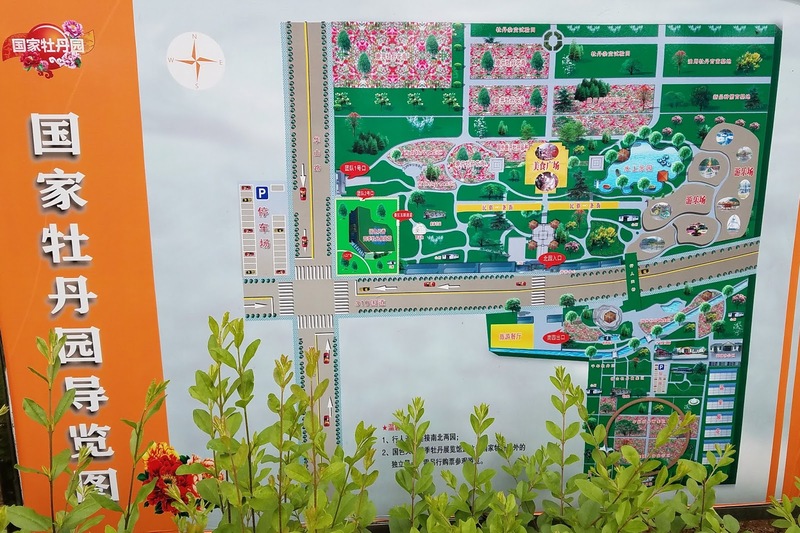 As you can see from the map of the Luoyang National Peony Garden below, the garden is quite large, and there is quite a lot to explore! 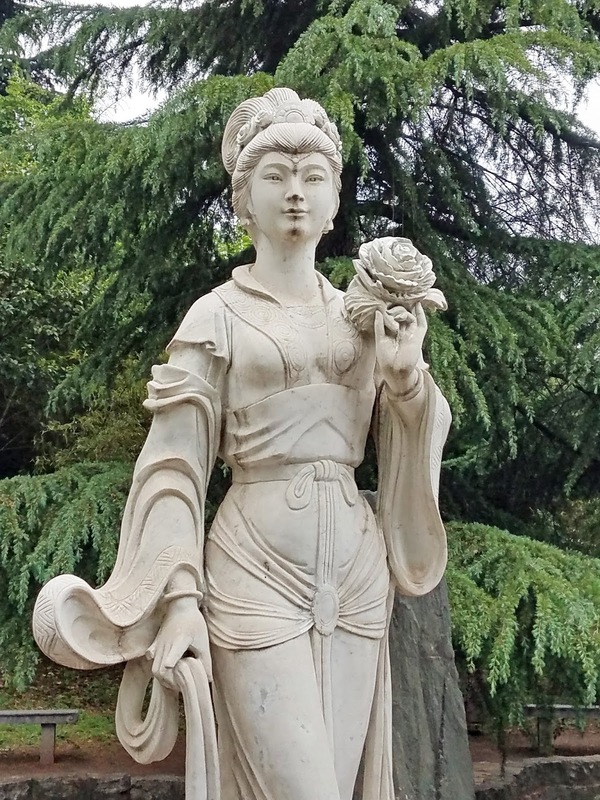 This peony lady statue we found in the South side of the Luoyang National Peony Garden, is the same style of peony lady statue seen in several peony gardens throughout China. Perhaps they are all by the same artist. 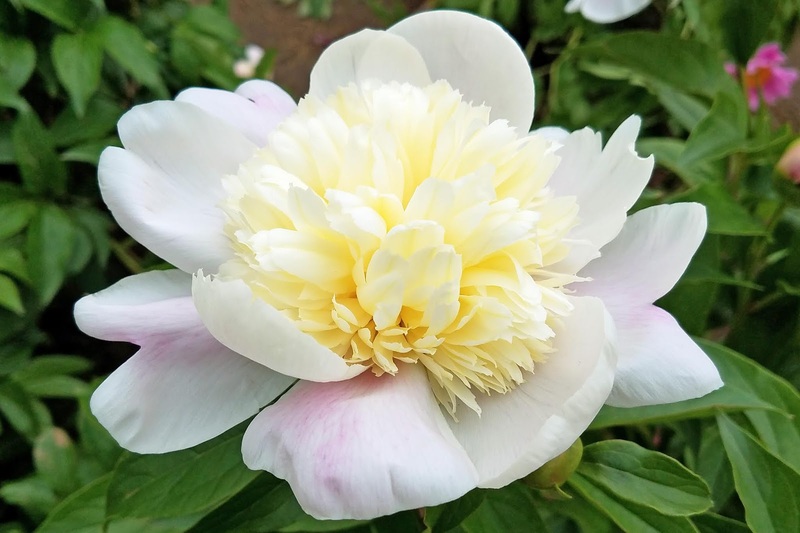 I saw a similar one on my trip to the Shanghai Botanical Garden, 2013 Peonies in Beijing, Shanghai, and Suzhou China. This particular peony lady statue sat atop a platform in the middle of a small pond water feature. I love how her robes just flow in smooth arcs, like a meandering stream, and check out the detail of the peony she holds in her hand. She also wears a crown of peony flowers as well, so royal. 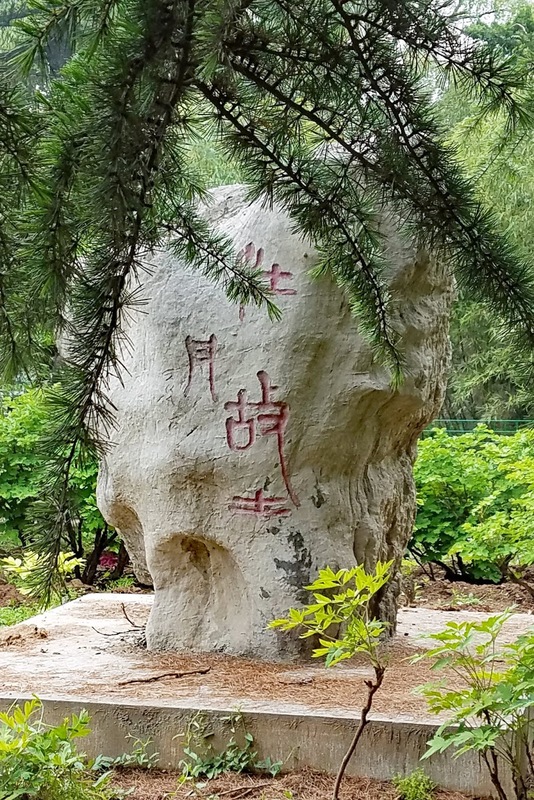 Not too far from the peony lady statue, we found the "Millennium Queen of Peony", which is what we call Paeonia ostii, and the Chinese call Dan Feng (丹凤). Tree Peony 'White Phoenix' is the most widely grown cultivar of this species here in the US. This particular clump of Dan Feng was not in bloom when we came to see it, but I'm sure it would have been gorgeous in full bloom. The mother plant here seemed to be very old and was probably over 8 feet tall and maybe wider. 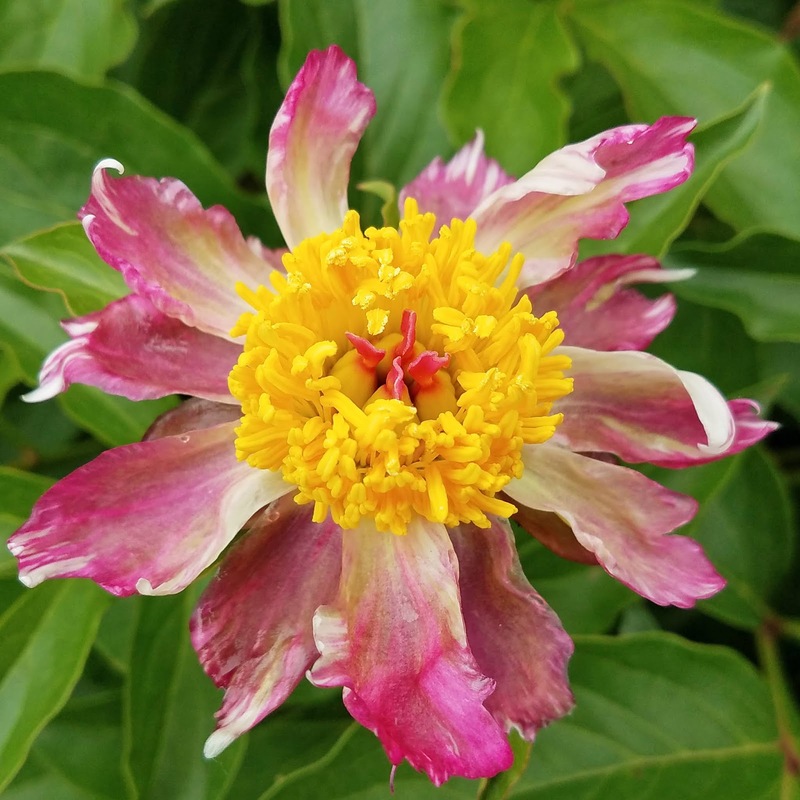 I am not surprised to hear about the strong roots of this peony and its adaptability to stress. 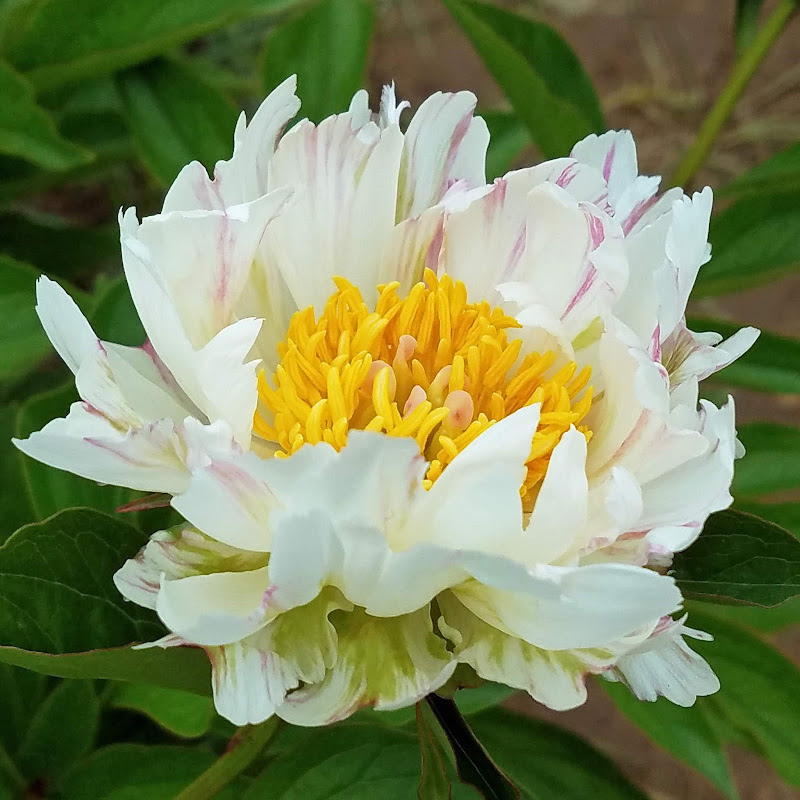 The Tree Peony 'White Phonix' was just named a Southern Peony Best Performer this year, 2018 Tree Peony 'White Phoenix' Best Performer - Week 2. The "Millenium Queen of Peony" was grown in native brown dirt, which appeared to be thick with clay, and with no top dressing. 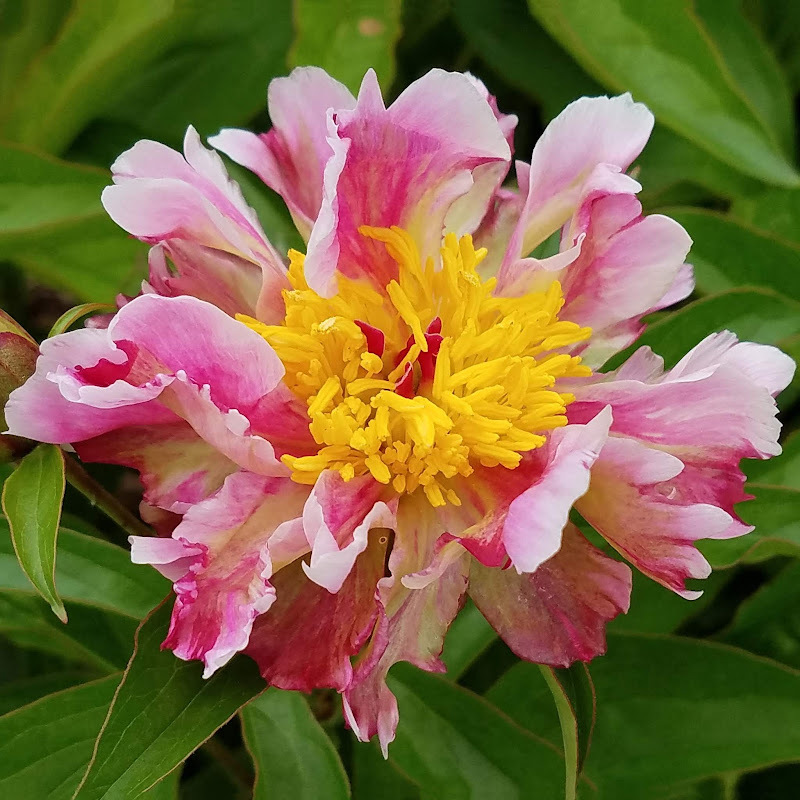 "Danfeng peonies which have strong root system are the descendant communities of the old Yangshan peonies. They are many traditionally cultivated for medicinal use. 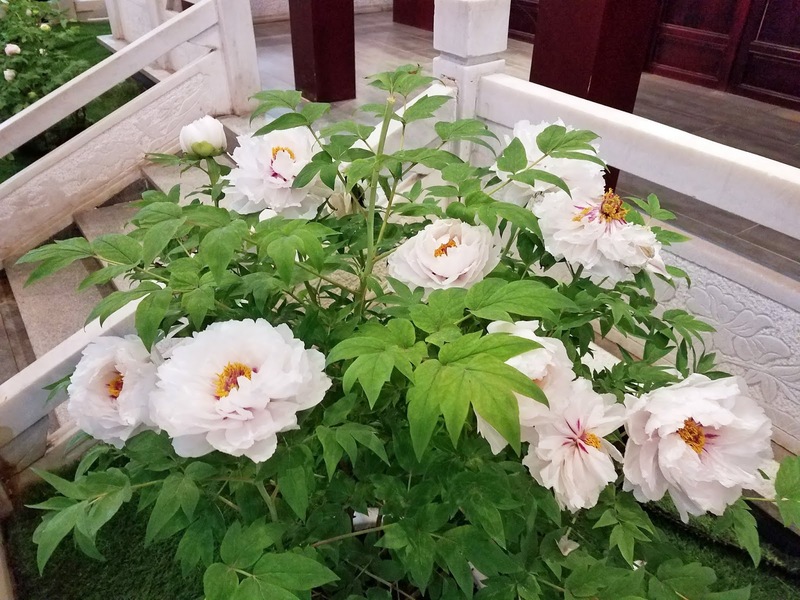 The ?ampeo slips of Han Dynasty unearthed from Wuwei tomb Gansu province are the demonstration the peonies for medicinal use could be dated back to 1,900 years ago, Millennium Queen of peony is a cultivar of Danfeng peonies which are featured for extensive adaptability, strong growth potential and good stress resistance. 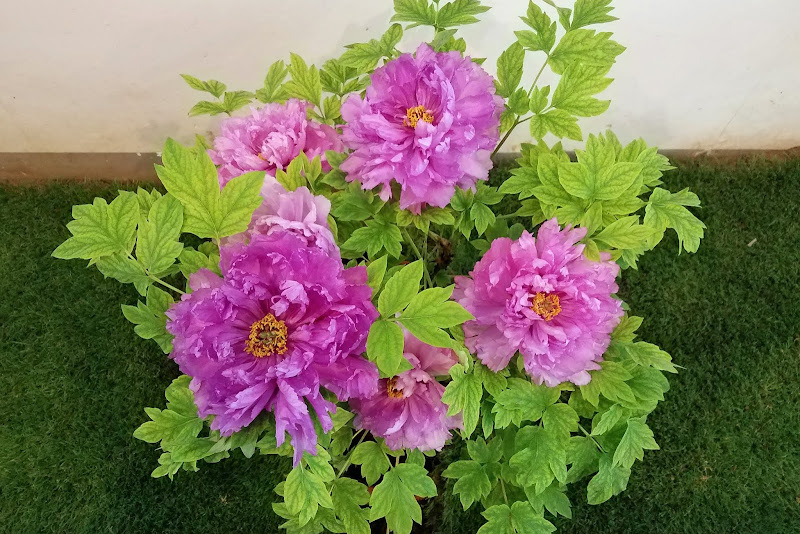 Years of cultivation has formed splendid and unique Dangfeng peony clumps, which are the largest Dangfeng"